Penny + Grace is a monthly jewelry subscription box specifically designed for people who love a minimalist, delicate aesthetic. Pick your preferred color of metal (gold, silver, rose gold, or “surprise me”), earrings or no earrings, and ring size (6, 7, or 8) and you’ll receive a monthly set of jewelry to satisfy your tastes. This is a review of the “Surprise Me” with Earrings and size 6 ring, $19.99 a month, subscription. According to the Penny + Grace site: “each delivery is guaranteed to contain a combined retail value of $55+ (USD) in varying jewelry pieces tailored to your color/metal choice.” All jewelry is 100% lead and nickel free. Each piece comes packed inside its own little drawstring pouch. They’re perfect for travel to keep items from getting tangled and also work as little gift bags. Then, everything is packed into this black canvas zipper pouch which is another great travel tool. These also work for organizing all the little bits in my purse like pens, lip glosses, and bobby pins. The Products: Each box will include 3 coordinating jewelry pieces in your choice of metal. (18k Gold, Silver, 18k Rose Gold options, or a “Surprise Me” option). All jewelry is 100% lead and nickel free. Here’s the info card for the pack. It tells you what is included and the retail value (USD) of each piece. This little silver necklace is about 19″ long with 3″ of that being extended. I like how Penny + Grace builds their extension links into the chain so everything is as seamless as possible. The pendants are a tiny little gem-encrusted X and shiny O. Cute! I’m always surprised at how small the bracelets are from Penny + Grace. I have it hooked on the middle link here and I had to get help to clasp it. The longest length is about 8″. The chain style is the same as the necklace with the built-in extender links. The X and O pendants are the same too except they are set in place, keeping them in the center of the bracelet while you wear it. Encrusted with the same micro pave look as the X pendants on the necklace and bracelet, this eternity band is a perfect coordinating piece. It’s super dainty on its own but would look great stacked with other bands. It feels a little scratchy when it rubs against some of my fingers since the texture is all the way around. The Verdict: This month’s Penny + Grace set is cute. I’ve been enjoying the variation in metal tones every month since I choose “Surprise Me” for that option. I also like the minimal glitz on the X pendants and that the ring can be stacked with my other dainty bands for more impact. The box costs $19.99, including free shipping, and the estimated value of the items inside (based on the values listed on the info card) is $66. The average cost per item based on the price of the subscription is $6.66. 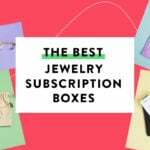 Check out all of our Penny + Grace reviews and more jewelry subscription boxes in the Women’s Subscription Box Directory! Keep Track of Your Subscriptions: Add the Penny + Grace subscription box to your subscription list or wishlist! What do you think about Penny + Grace? How do subscribers rate Penny + Grace? Do you subscribe to Penny + Grace? Add your rating now!